Adds base-building, survival and creative modes, alien recruitment, item-stacking, and much more. Well, I wasn't expecting that promised No Man's Sky update to arrive quite so quickly. Foundation is here, and it lets you build bases on abandoned outposts. It also allows you to recruit alien settlers to those outputs, and adds two new game modes including a Survival option. More importantly, update 1.1 introduces item-stacking to the spacey survival/exploration game. Item-stacking. Item-stacking. You can now stack items in No Man's Sky, or you can when you've downloaded the update, anyway. You can also now play No Man's Sky in one of three modes: the Normal one we're all familiar with, a Creative mode that lets you "build a huge base" and explore the universe "without limits", and a Survival mode that obviously makes more of the game's survival elements. To make not dying more achievable, you can now stack items up to five times, and make use of a new Quick Access item menu. You can purchase enormous freighter ships, and summon them to your position from "anywhere in the galaxy". You can also teleport resources directly to your freighter, while you tramp around on planets looking for heridium. 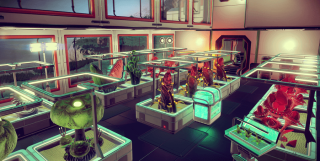 Base-building, meanwhile, will let you farm crops and research technology, among other things. You'll be able to teleport back to your base from space stations, and vice-versa, and dismantle bases easily when you come across a more attractive planet you'd prefer to settle on. Have a read of the full patch notes for more.